For thousands of years Sabah’s Kinabatangan River has wound its way down from the hills of Borneo’s northern interior through some of the planet’s richest lowland rainforests before flowing into the Coral Triangle. Crises in ecosystems unfold over time. In the late twentieth century, events up-river brought massive change in the Kinabatangan’s catchment. It is the growth of citizen science around systematic water quality measurement, carefully targeted (by indigenous knowledge) in the places and moments that matter in complex rapidly changing watersheds, that appears to offer the best way to identify and tackle the causes and to guide river restoration. This post is a commentary based largely on presentations at Sabah’s International Heart of Borneo and Ramsar conferences in November 2016 — the views expressed are those of the author. For thousands of years Sabah’s magnificent 560-kilometer-long (about 348-mile-long) Kinabatangan River has wound its way down from the hills of Borneo’s northern interior through some of the planet’s richest lowland rainforests before flowing into the Coral Triangle through a massive and teeming delta of mangroves, peat swamp forest, and nipah palm. Over the centuries, the richness of this delta attracted skilled fishermen from the Orang Sungai, Suluk, and other indigenous groups to make their fine stilted villages on the shifting boundaries between land, river, and sea, trading with the interior and across the Sulu Sea. Some 2,500 of their descendants now live in the 78,000 hectares (about 193,000 acres) of the Lower Kinabatangan and Segama Wetlands (LKSW) in the river delta, which became, in 2008, Malaysia’s biggest Ramsar site. How can it be that regular mass fish deaths occur in such a well-managed protected area and nothing gets done to stop it? Two conferences in early November 2016 in Sabah, Malaysian Borneo, revealed powerful stories around why these fish deaths are happening and how – in the absence of other solutions – the villagers themselves are finding ways forward. Crises in ecosystems unfold over time. In the late twentieth century, events up-river brought massive change in the Kinabatangan’s 16,800-square-kilometer (6,487-square-mile) catchment (which is almost a quarter of Sabah). The expansion of roads, bridges, and logging in the 1960s was followed from the 1980s by massive growth of flood plain oil palm estates. Meanwhile, parts of the delta mangroves were clear-felled for building Sandakan town’s pilings, for post-WW2 electricity generation in Hong Kong, for charcoal production across the region prior to electrification, and, in the 1980s, chipped for the manufacture of “rayon,” then a newly popular textile, as reported by Dr. Ong Jin Eong in his opening address at the second of these two conferences. At first the landscape absorbed these shocks and many villages benefitted from better market access for their fish, prawns, and crabs, and from some new and more deadly fishing technologies, including river-based trawling. The trawling supplemented the handwoven, baited traps that can be raided by crab-eating macaques, and it decimated the giant river prawns that were once so abundant that they were sold for just two to three percent of their current price and exported as far as Hong Kong and Taiwan. The land suffered too: Many villagers recall how they joined (albeit on small scales) the logging and oil palm operations that characterized the agro-industries, particularly in the riverine areas that constitute their traditional territories. 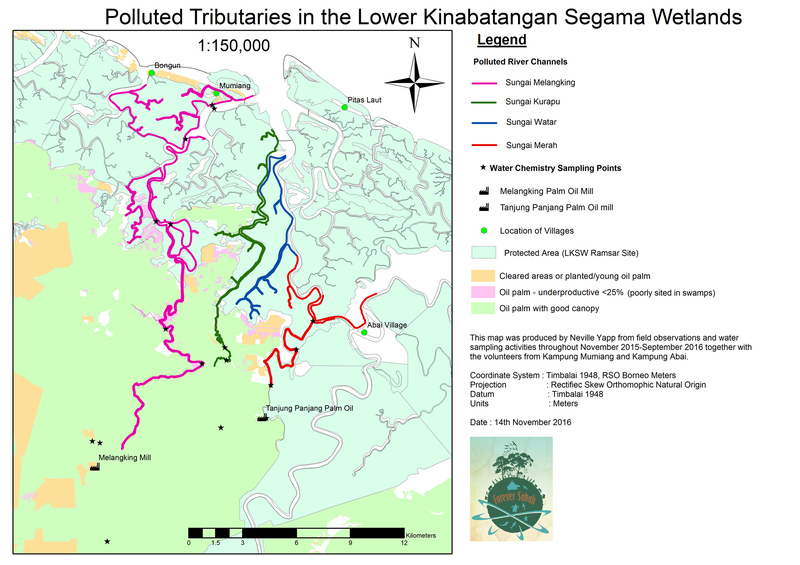 Needless to say, however, the reckoning has been rapid, as the Kinabatangan and its tributaries reeled under massively increased sediment loads and nutrient discharge. By the early 2000s, WWF reported serious problems with respect to effluent from palm oil mills, pesticides, fertilizers and sediment from plantations, sediment from logging activities, and sewage and refuse from villages along the river. The Sabah State Government and a suite of local and international NGOs have worked hard over the last two decades to contain land-use change in the “Kinabatangan Corridor of Life” (which the Government made their “Gift to the Earth” in 1999), mainly through seeking to protect remaining forest parcels, ensuring the continuation of the area as one of Southeast Asia’s top wildlife-based ecotourism regions. 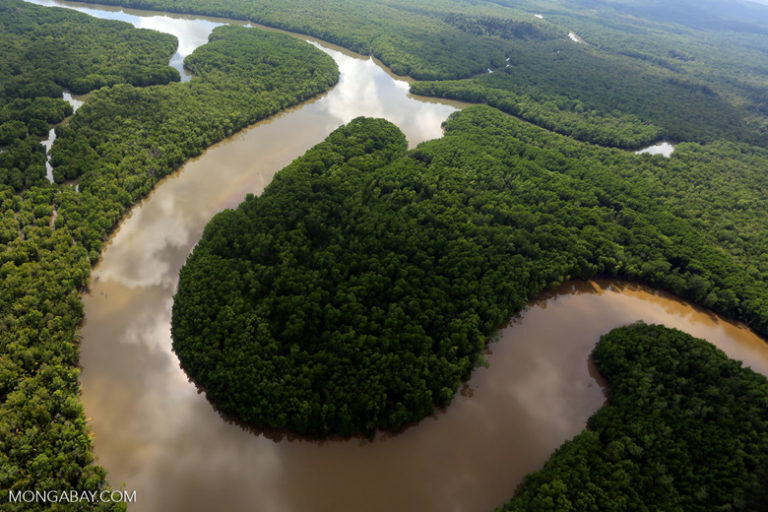 From 2005, when the core of Kinabatangan Delta was first protected, the resilient mangroves recovered rapidly and the vegetation around the intermittently poisoned rivers now appears healthy. Rivers, however, tell the whole truth. Water flows from the protected and unprotected places, and especially it flows from catchment sections that have been damaged. Having 300,000 hectares (741,316 acres) under oil palm industrial monoculture with 30 processing mills upriver simply hurts; especially as this is mostly without the significantly improved standards promulgated by the Roundtable on Sustainable Palm Oil. Extensive ditches drained floodplain estates, too many of which were in unsuitable areas such as swamp forests and areas vulnerable to flooding. Indeed, a detailed study by Dr. Nicola Abram and colleagues showed that by 2010 an estimated 16,000 hectares (39,537 acres) of forest cleared for oil palm was failing to provide economically viable yields even as it continued to degrade the catchment. 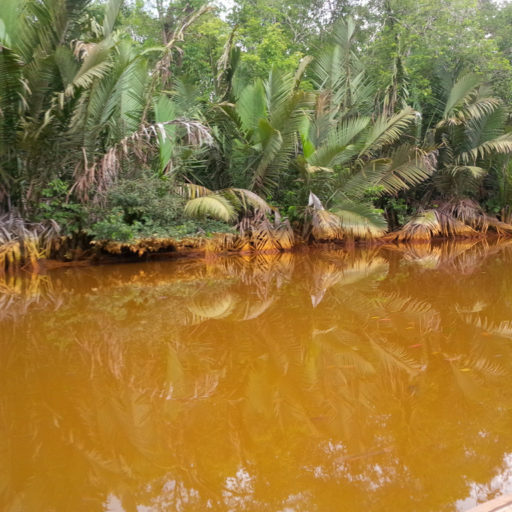 Neville Yapp of Forever Sabah at a drain with highly polluted discharge from an oil palm estate. Efforts to tackle the mass fish deaths indicated an important problem. The Sabah Forestry Department, which manages the Ramsar site and most of the protected areas in the region, are not a water quality agency, and the agencies responsible (Environment Protection Department, the Fisheries Department, and the Federal Environmental Department of Environment), do not have staff on the ground in these remote areas. Staff they send to evaluate conditions therefore arrive only days later, by which time the endless motion of the delta with its floods and tides has dispersed the poisonous water bodies. While relevant government agencies have confirmed that extreme acidification and de-oxygenation events have occurred, they have not able to collect the evidence or identify a mechanism to identify and hold those responsible to account. Extensive coverage in Sabah’s newspapers and expressions of concern in the State Assembly, from the Chief Judge of Sabah and Sarawak (Tan Sri Richard Malanjum) and others, has not lead to workable solutions. Regular calls for action from the Sabah Forestry Department have fallen unheeded. After the November 2015 incident, the Fisheries Department did its best to help by providing new fish stocks to the community, but this could not prevent many of these same fish dying in a second pollution incident in September 2016. A few hours up the Kinabatangan River by boat from Mumiang at the village of Batu Putih thrives the community-based ecotourism cooperative called KOPEL. Twenty years of community initiative, backed by training with field-oriented local NGOs, means the villagers of KOPEL now have the capacity to investigate and tackle their own environmental issues. One of these was why the local fishing industry, which had engaged 70 percent of the local population in the 1980s, has now all but collapsed. The species present had changed and the vast shoals of fish were long gone; mesh size on remaining nets had been obliged to shrink from six inches to just over one inch wide. Villagers had been reporting fish mortality for years to largely indifferent officials who, say villagers, dismissed their concerns and derided local knowledge accusing them of over-fishing. 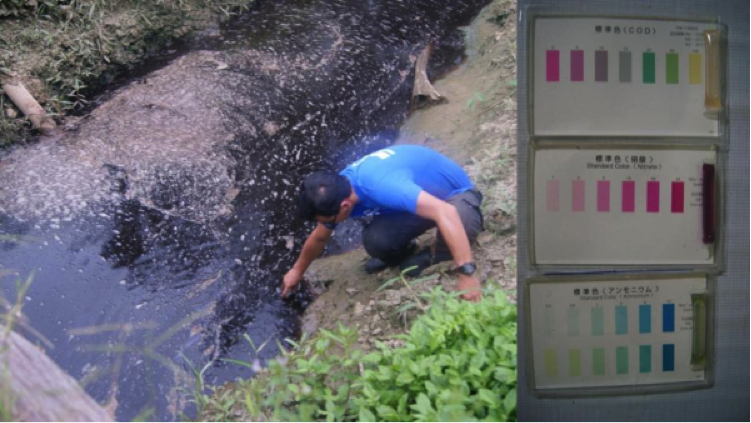 Therefore, in 2012, KOPEL established its own water quality monitoring team under the leadership of Rosli Jukrana, with initial training and equipment from the Rakuno Gakuen University in Japan and funding from Japan’s International Cooperation Agency (which has a longstanding concern for oil palm’s impact on Kinabatangan waters). 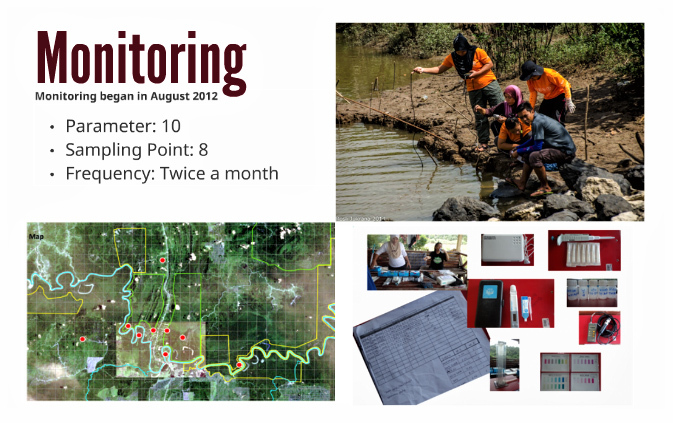 A team of six villagers then began twice-weekly monitoring of ten parameters at eight carefully chosen sampling points across their riverine territory. They also developed the ability to deploy immediately in cases of suspected pollution events, and went to investigate sites near mills where Palm Oil Mill Effluents (POME) residues are dumped rather than composted and placed back on the land as per regulations. Earlier this month, Rosli Jukrana told a packed meeting room at Sabah’s International Heart of Borneo Conference what this citizen science had told the ex-fishermen of Batu Putih, which was that the problems were in the tributaries, not the main river, and it was land-use change on the private estates that had turned their favorite fishing areas into brown-water deserts. Their top site, the Butong stream, for example, runs just one kilometer from the Lower Kinabatangan Wildlife Sanctuary. But now it is largely devoid of fish. 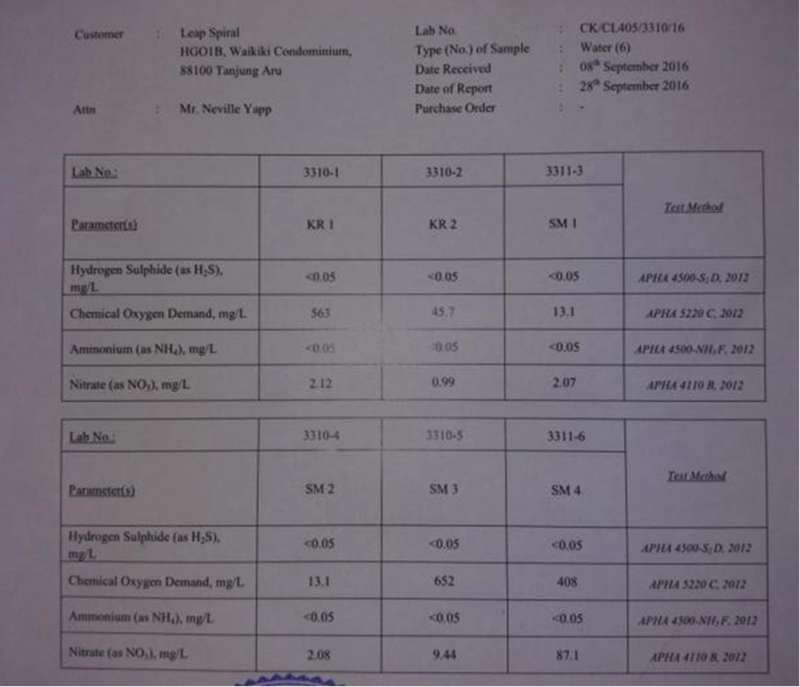 This is because periodically Chemical Oxygen Demand (COD) levels could rise above 680 milligrams-per-liter, whereas the acceptable level is 100. 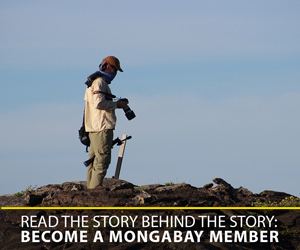 It was therefore to the skills of KOPEL that the delta villagers of Mumiang turned when they experienced the second mass fish death within twelve months, and Rosli powered down-river with his water quality team and equipment. As reported in this powerful video, they identified that the fish deaths had followed deoxygenation events driven by algal blooms that result from excess nutrients in the run-off from oil palm estates. But where exactly was this run-off from and how could it be tackled? Mumiang Village’s Development and Security Committee head Mada Hussin was reported in the press at the time as saying that the investiga­ting agencies should review their Standard Operating Procedures as the delay in collecting samples did not translate into data that would be useful for mitigation or enforcement measures. 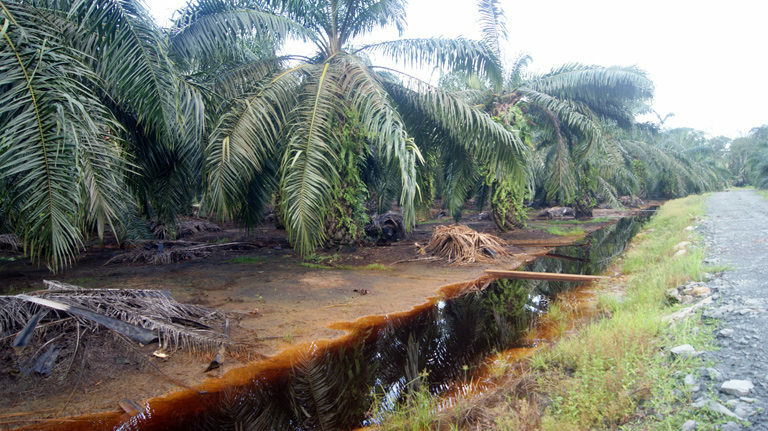 Mada added that the Malangking river, a tributary of the Kinabatangan, might be polluted with run-off from an oil palm estate, especially during a downpour. Where, then, was the source? Could it be proven that the oil palm estates and mill up the Malangking River were the source? After the 2015 mass-death in the Mumiang, I sat with a group of villagers sitting around their empty nets and tanks while they explained to me at length their suspicions. They did this with such a wealth of detail and without any kind of map that despite a good deal of experience in dealing with what you might call “indigenous limnology” I was left totally confused. In a vast delta like this one, the coincidence of tides and floods can carry blocks of polluted water in unexpected directions, including back up river. Indeed, this has been shown in a recent University of Birmingham doctoral thesis on the Lower Kinabatangan by Dr. Sahana Harun, an example of great science yet to be effectively connected to problem-solving on the ground (or in the water). How could evidence ever be assembled that the authorities could use to tackle the issue? For the water chemist, the task is far from glamorous science, and requires being on site for months on end to catch moments of algal boom and deoxygenation events. For the ethnographer, it can take years of listening to understand local knowledge systems. And for both, the result is too often a paper, not an action. The solution, it seems, came following Rosli’s field visit and it involved not outside experts but the deployment of the Mumiang villagers own mapping and now water sampling skills. These are capabilities which have grown leaps and bounds under a collaboration between the Sabah Forestry Department and Forever Sabah, with seed funding from the GEF Small Grants Fund and IUCN. These new skills in measuring water chemistry had been integrated with their long-standing intimate knowledge of local currents and water flows, and their love of all things fish. The fruits from this progress were shared at a second important Sabah conference this last week, this time on the Lower Kinabatangan Segama Wetlands Ramsar site itself. Here, Neville Yapp of Forever Sabah, a collaborative that facilitates Sabah’s transition towards a more diversified, equitable circular economy, shared, amongst other things, a crucial map (see figure). The map shows the various channels, including the Malangking, down which bodies of super nutrient-charged water are periodically flushed, and then sometimes driven back upstream or laterally when they coincide with rising tides into the villages of Abai and Mumiang, where villagers culture large populations of wild fish (to compensate for declining catches in open water). These preliminary studies show water in the Malangking, critical spawning habitat, can be five to 15 times worse than accepted maximums, sometimes measuring beyond the available color charts, with higher COD than expected in a sewage drain. The map Neville shared was prepared with the sampling and other evidence of the villagers and shows how it is possible to identify which oil palm estates are responsible for which fish death events. It includes water sampling points, but its evidence source is diverse. Moving around in their local boats and chatting with the estate workers, the villagers can supplement sampling with surprisingly frank conversations. For example, checking out the upper Malangking, they learned that over-worked migrant laborers often find it easier to pour fertilizer into the drainage ditches than painstakingly apply it to each palm oil across the estate, and that high through-flows at mills can lead operators to dump excess Palm Oil Mill Effluent (POME) and rely on heavy rains to wash it away before they can be seen to flaunt regulations. The villagers also discovered why another tributary coming out of the palm oil estates was not causing mass deaths downstream: its owner was using much less fertilizer, and there are healthy fish populations even in the drains within the estate. This is encouraging because in 2015 Sabah mandated the transition to 100 percent Certified Sustainable Palm Oil by 2025, and moderation in fertilizer use and use of riparian corridors are among the requirements for this. Armed with evidence of where the pollution is coming from, how does a society persuade polluters to change practices or pay compensation? In this case, sadly, it appears the courts will be necessary, so there remains the challenge of admissibility of evidence. 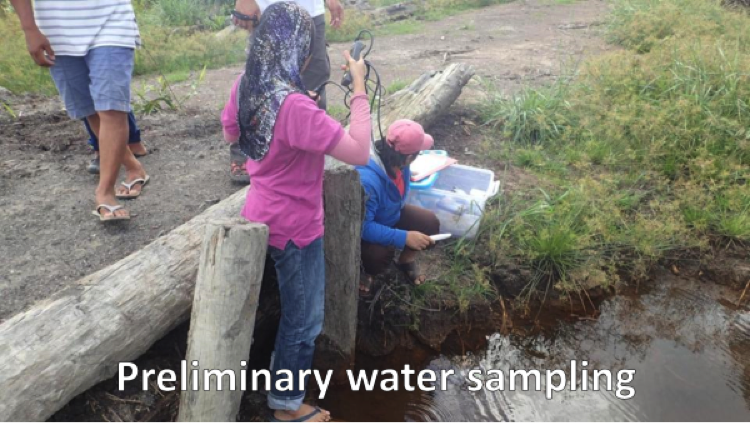 To prevent fraud, the court system in Sabah only accepts water quality analyses from authorized sources, but these, of course, do not (yet) include community citizen scientists. Participants at the Heart of Borneo conference therefore called for innovative solutions through partnership with government and the courts. For example, Haji Hussin Tukiman, the dynamic Forestry Officer responsible for the Ramsar site, suggested that communities be allowed to submit key samples to government-recognized laboratories; Rosli, meanwhile, suggested the government consider appointing as “Honorary Water Quality Wardens” individuals who met recognized technical standards, in the same way as they currently do in other areas such as Wildlife. Local knowledge is indeed becoming more respected. The Fisheries Department has been studying the problem and welcomed the community pointing out to them that in restricting sample to the village areas they were missing the sources, and agreed to sample these locally known pollution routes. And the Forestry Department is also working increasingly closely with communities to understand and tackle the issue, and they may also manage to bring Dr. Sahana’s valuable scientific knowledge “of spatial and temporal trends in dissolved organic matter” in the Kinabatangan Delta into the local mix. All this is aligned with the calls by Malaysia’s Minister of Natural Resources and Environment, Dr. Wan Junaidi Tuanku Jaafar, for greater partnership with communities and civil society. 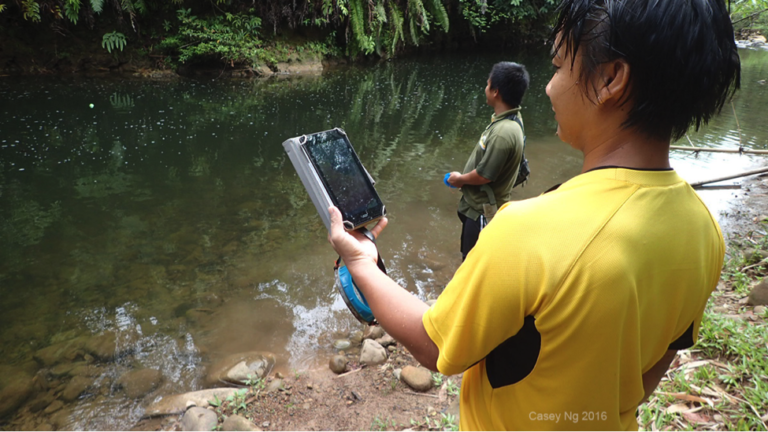 Indigenous citizen science is not for technophobes: here villagers on the Moyog River use an affordable underwater sonar scanner donated by a sympathetic fisherman from England to assess populations on a “Tagal” section where taboos mean only “non-intrusive” sampling techniques can be used. Citizen Science – such as learning how to map your territory – has been explosively successful among Indigenous Peoples worldwide over the last two decades. Here the youth of a local village learn how to use a GPS. Casey Ng runs Forever Sabah’s “Freshwater For the Future” (FFF) program. Among other things, FFF deploys citizen science in documenting fish species so as to enable Kadazandusun villagers to monitor river water quality in the Moyog catchment of Western Sabah, and the impacts of their “Tagal” indigenous river management systems (which uses community oath-stones and taboos to manage fishing intensity in space and time). In the Moyog the issue is not oil palm: it is about maintaining forest in the face of hill cutting for construction material, rubber establishment, poorly conceived settlements, a poultry facility, waste disposal, etc. 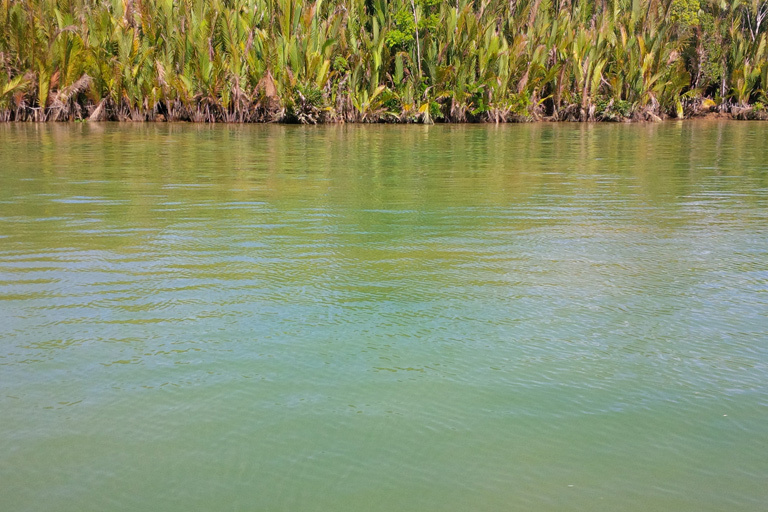 River water quality mobilizes more conservation concern than probably any other environmental issue in Sabah. Winnie Jimis and other local citizens created “Community-Led Environmental Awareness for Our River” (CLEAR) to tackle these problems on the Moyog back in 2012, and have been busy ever since. Last year they began deploying a Japanese developed application of bio-active microbes to clear water waste. Working with Kivatu Nature Farms, a nearby indigenous agro-ecological farm and training center, villagers learned to brew the microbes for themselves and apply them to the river in mudballs. Early this month villagers from Kibabaig used test kits to assess water quality in the Baku tributary that runs through their land and began a systematic “Effective Microbes” program of water treatment. Prior to the treatment, their water ran high in ammonia and phosphorous, as well as coliforms, and had a dissolved oxygen level of just three parts per million: too low for much more than air-breathing catfish and the like. 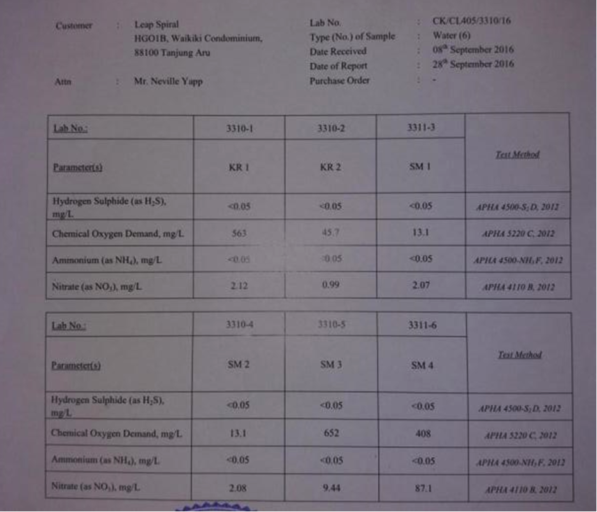 In this interesting example of citizen science, these indigenous NGOs have taught villagers to use their own test kits to assess and evolve the effectiveness of their own treatment regime. Their initiative is all the more remarkable because pollution of their humble stream has just caused the suspension of operations of an important urban water treatment facility at Kasigui downstream and the authorities are now obliged to further draw down water from nearby Babagon Dam, despite low water levels. It is not difficult from this to see the connection between this kind of watershed action and citizen science and development of “payment for ecosystem services” systems (another theme at the Heart of Borneo Conference) to reward community watershed stewardship, as is indeed now under discussion in the Babagon catchment. In his presentation on the Moyog River at the Heart of Borneo conference Casey emphasized how citizen science often built off indigenous knowledge – such as where and how to catch indicator fish species – and that its power was the fact that it was driven by local questions that immediately connected people to what they value about “their own place.” Despite challenges with getting citizen science published and accepted by mainstream science, Casey described it as “relevant, practical, affordable, inclusive, and above all communicative to the stewards of local rivers.” At this point in the proceedings over 200 people from communities and government, civic organizations, universities and private companies in Sabah savored this new idea, perhaps compared it to the performance of mainstream science at solving local problems, and applauded him enthusiastically. Casey’s presentation at the Heart of Borneo was alongside Notoruss village elder Vitalis Galasun, who, in 1994, ushered in the modern era for “Tagal” management systems when his community took a collective oath to not fish their section of the river with formal recognition for the first time from the Native Courts, local Assemblyman, Police, and ultimately the Fisheries Department. To frequent applause, Vitalis told his audience at Heart of Borneo that there are now 29 registered “Tagal” programs in the Moyog region alone (the Fisheries Department now registers about 600 state-wide on 200 rivers in 17 districts) and Vitalis welcomed current efforts to integrate citizen science with traditional knowledge in the management of these programs. Explaining this, he described how they didn’t need any measurements to be convinced how rapidly most fish stocks recovered, but that other questions remained, like why some species declined even as others expanded, and whether there were invisible pollutants getting into their rivers. This matters because, as Vitalis explains in this delightful video about the making of “bosou,” a local fish pickle, “all of the species in this river are delicious” – and fish are the main source of protein in Borneo. Describing the kinds of unexpected benefits from citizen science where, he said “you learn in all directions and not just about the target parameters,” Casey described how indigenous fish samplers headed for flowering Hopea trees, because they knew many species would congregate under these trees in order to eat the inflorescences, perhaps to sequester bright pigments important to their breeding. “You may not know this,” he said, judging his astonished audience rather well, “but fish need to ingest pigment from natural food grown on riparian areas to display vibrant colors and patterns on their bodies as a sign of vitality. So, if colorful food is not available they can’t get girlfriends.” He also described how the Notoruss community had quickly shown him a fish in the genus Rasbora, which has been unknown to science, but which locals call “lumpis” in their own language. Moreover, he said, they are very familiar with catching nocturnal species and those that forage and hide in the riverbed and under pebbles, which are often hard to locate with conventional scientific sampling. 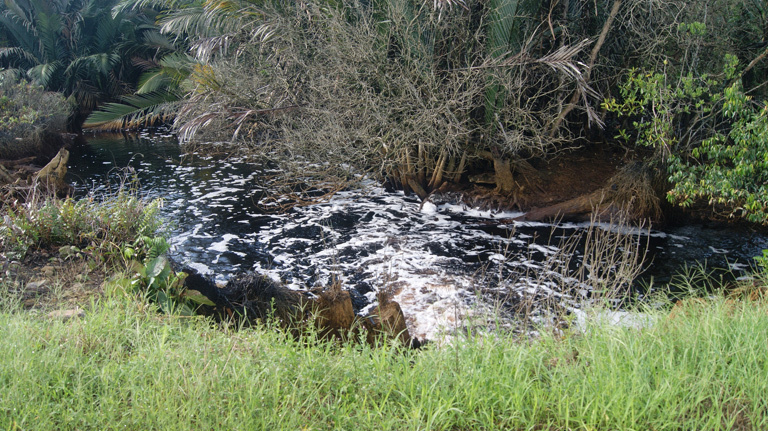 Highly polluted discharge from an oil palm estate. At the Heart of Borneo Conference, Rosli Jukrana shared his KOPEL community’s sampling parameters, locations and equipment. Generating ripples of laughter from his audience, Casey closed his talk by explaining that successful citizen science is not only about sampling techniques and accessing cheap new technologies, but instead equally about the social process of building relationships in a community. He described that it was not writing memos, but sitting around sipping drinks that would engage the men, and that it was crucial to understand that decision-making was not nearly as in the hands of the men as might appear and that behind the scenes in their kitchens women were very influential. “If you can get through the ladies, you will have the men,” he said. “That is Citizen Science 101”.